Fortnite Week 8 Challenges are live right now for all Battle Royale players, and you can complete as many of them as possible to bag yourself a ton of Battle Stars. In this Fortnite Week 8 Challenges guide, we'll be detailing everything you need to know about the latest batch of challenges, so you can have all seven challenges for the week completed as quickly as possible. 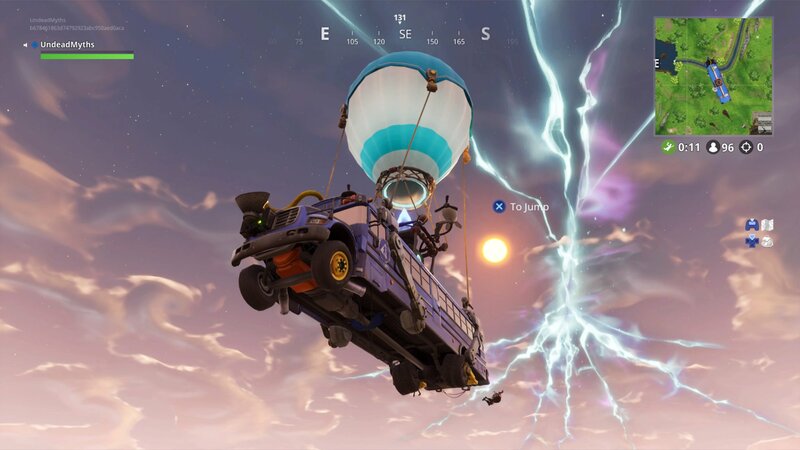 But if you instead need anything else on the current seasonal event in Battle Royale, you’ll want to head over to our Fortnite Season 5 guides hub. It’s in here that you can find a complete list of all the challenges that have gone live for the season so far, but if you want a guide on what we reckon could be coming in the next season, make sure to check out our Fortnite Season 6 guide. These might be the latest challenges to arrive in Fortnite Battle Royale, but don’t forget that every challenge that’s launched so far for the season is still available to be completed until Season 5 wraps up. If you need a helping hand in completing all tasks from the previous week in Battle Royale, you’ll want to instead head over to our complete Fortnite Week 7 Challenges guide. Just below, you can check out the full list of all seven Fortnite Week 8 Challenges. These challenges only went live today on August 30, at right around 6 am PT/9 am ET. 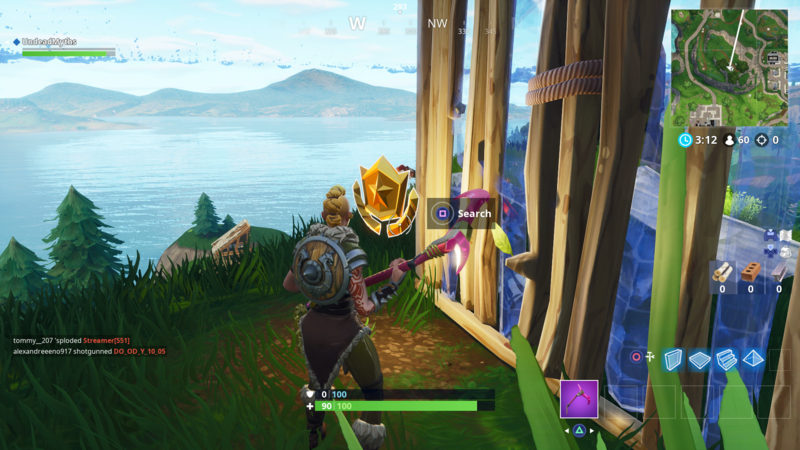 Search chests in Wailing Woods (7). Deal damage with a pickaxe to opponents (250). Use a rift at different spawn locations (10). Search between three oversized seats. Stage 1: Eliminate an opponent in Greasy Grove. This sounds like it'll be one of the easiest challenges to complete this week. 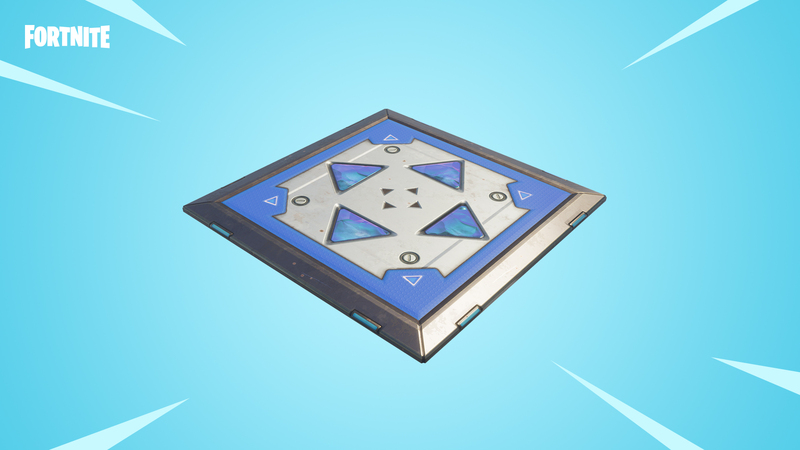 Keep in mind that all you need to do to complete this challenge is to simply place ten traps on the ground, and you don't even need to have any players step into the traps or set them off. To complete this Fortnite Week 8 Challenge, you're going to need to track down seven chests in total in Wailing Woods, but this doesn't have to all be done in the same match of Battle Royale. For a full list of where you can find chests within the woods, head over to our Fortnite Wailing Woods chests guide. This might be a 'hard' challenge, rewarding ten Battle Stars on completion, but it shouldn't be too difficult to complete. This is, if you've got a steady aim with a shotgun in your hand. This isn't actually the first time that a pickaxe damage challenge has appeared in Fortnite Battle Royale, as it featured in Season 4 earlier in the year. 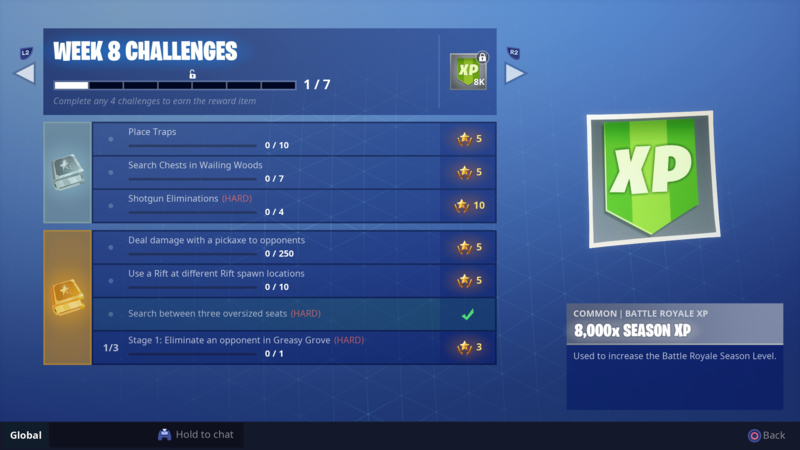 To complete this challenge, all you need to do is deliver 250 points of damage to players with your pickaxe, in as many games of Battle Royale as necessary. You might know that rifts pop up randomly around the Fortnite Battle Royale map, but there are a certain few you'll need to use if you want to complete this challenge for the week. For the complete list of the rifts you'll need to use for this challenge, head over to our Fortnite Rift Spawn Locations guide. 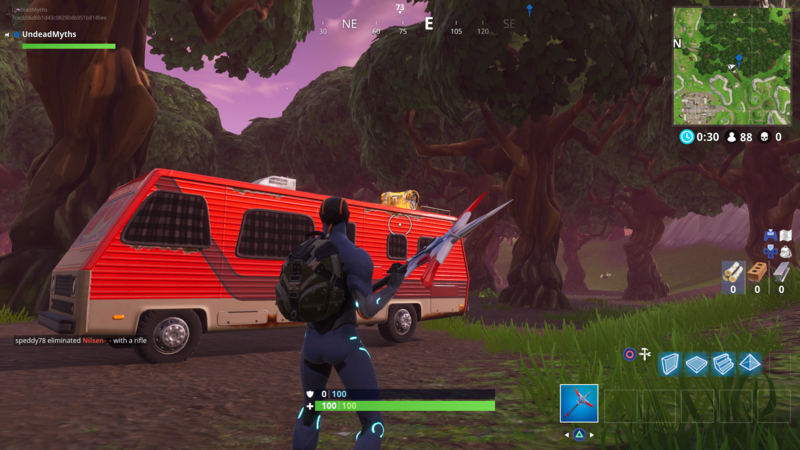 This makes up the 'treasure' challenge for the week, where you have to head to a specific location on the Fortnite map. For a full walkthrough of where you can find the actual Battle Star to complete this challenge, head over to our Fortnite Oversized Chairs guide. This brings us to the end of our guide on the Fortnite Week 8 Challenges, but as we mentioned previously, make sure to check back on this guide once they’ve all gone live.